This isn’t the first time where Insiders have made a big impact on Sticky Notes. We’ve been eagerly tracking Insider feedback ever since the Windows 10 Anniversary Update. Back then, we had just introduced support for Windows Ink and Cortana. Insiders were excited about the changes, but they also reminded us that there was room for improvement. One thing we heard was that the new notes were a bit too large. Insiders wanted smaller notes to free up space on their desktop — and give them the option to post more notes. They also felt that the standard font size was too big. We got to work right away on these updates in RS2. The secret of Sticky Notes updates — revealed. 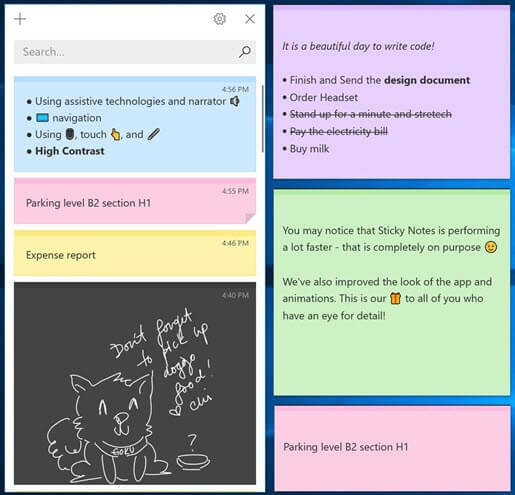 Windows Insiders were among the first to see the preview versions of Sticky Notes in RS2. But what a lot of people don’t realize is these versions of the app are delivered to the Microsoft Store rather than the Insider Preview builds themselves. This is actually a faster, more efficient way to get Sticky Notes updates out to Insiders. When we have a new version of Sticky Notes for preview, an alert appears automatically on the app on an Insider’s device. Simply click on the alert and the new version is downloaded from the Store. One thing to note: these preview versions of Sticky Notes are targeted to specific Insider Preview builds. Not everyone will see these alerts — and only Insiders running compatible Insider Preview builds will actually see preview versions of the app in the Store. This allows us to target our testing and use Insider feedback more effectively. We’re listening to Insiders — on two channels. Along with being an effective platform to distribute preview versions of Sticky Notes, the Store has also proven to be a useful feedback tool. Together with the Feedback Hub, these two feedback channels have allowed us to track and respond to feedback — often, within hours. In RS3, for example, we had an issue that was preventing the app from launching. It only affected about 1% of all users but our system quickly picked up on reports from these users. We were able to reach out to many of these users to better understand the problem and, within less than 24 hours, we had resolved the issue and released a new build with a fix. We continued to improve performance of the app through the RS3 and RS4 with the help of feedback from Insiders. And Insiders continued to provide some great new feature suggestions. One particularly popular recommendation from Insiders was bulleted lists which we added in RS3. We also heard that people wanted an easy way to mark completed items on their lists. We had a related ‘strike-though’ feature in an earlier version of the app. Thanks to Insider feedback, we brought it back in RS4. During that time, we were also hard at work on a long list of other features that we would introduce in our next big update — Sticky Notes 3.0. It’s loaded with some exciting new features, including much faster performance. To Sticky Notes 3.0 and beyond. One of the most important updates to Sticky Notes 3.0 is device sync. This feature has been a popular feature request with Insiders. In fact, no other Insider suggestion for Sticky Notes has generated more upvotes in the Feedback Hub. Specifically, Insiders wanted an easy way to sync notes across Windows devices. And that’s exactly what we delivered. Note only that, Sticky Notes backs up your notes in the cloud and provides a single consolidated view for all your notes. A view of Sticky Notes 3.0 with the new consolidated notes view and Charcoal note. Now on to delivery of version 3.0. As it turns out, our updates to the app were completed near the end of the RS5 development cycle which means we couldn’t test them on Insider Preview builds. (The windows for new apps and features was closed.) 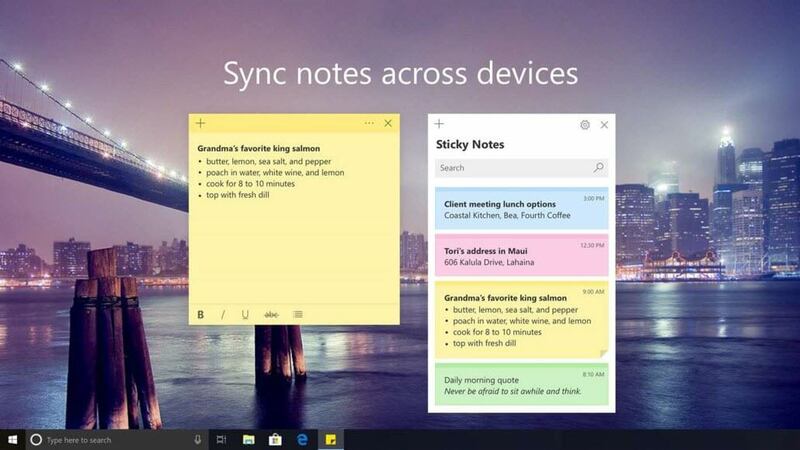 But fortunately, we had group of Insiders already on the next (RS6) version of Windows – so that’s where we headed, making Sticky Notes 3.0 available to all Insiders in “Skip Ahead”. As usual, the feedback was fantastic. In just a few short weeks, we had all the feedback we needed to confidently launch Sticky Notes 3.0 to world. So what does the future hold for Sticky Notes? We’ve got a lot on the drawing board, but one thing we can confirm is that dark mode for the entire app is part of the plan. We’re also working on bringing Sticky Notes to mobile devices. Of course, ongoing feedback from Insiders will continue to shape and prioritize our final development. So, keep that feedback coming! Look for Sticky Notes 3.1 in the next 2-3 months. And thanks, as always for being a Windows Insider.